For many years, when I drank tea I only needed two things: a cup and a teabag. That’s one of the things I love about tea—it’s simple. You don’t need much equipment to brew a cup. Brewing whole leaf tea can be messy compared with nice, neat, packaged teabags. But anyone who drinks a lot of tea eventually realizes that brewing with whole leaf tea gives many benefits including a much broader palette of fine teas to choose from, a fresher and tastier brew—and more taste for significantly less money. A teabag is a packaged product, and you pay extra for packaging. I didn't always know the function of different tea accessories, and I suspect that others have this experience too. 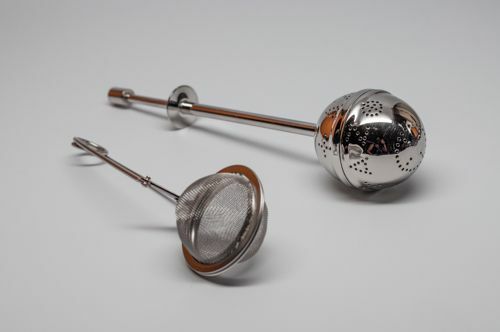 In this section I'll explain different types of tea infusers and strainers…because there's lots of different ways to brew a cup. The first thing I discovered in my hunt for a tea infuser was a handy little mesh strainer in the shape of a ball. I call them teaballs (as opposed to teabags). These have either a handle so you can stir it in your cup, or a chain so you can dangle it like a teabag. The teaball itself might be made of stainless steel mesh or solid stainless steel with holes in it. What I loved about my teaball was that I could brew tea in a cup just like I did with a teabag with the added benefit of using loose, whole leaf tea. It was a great first step. A lot of people love using these, and I did, too, for a long time. One of the things I noticed, though, was how the tea leaves expanded when infused in hot water. If the strainer was overfilled it practically burst open after a few minutes of infusing because the tea leaves expanded so much inside. I began to wonder if this really provided a good brew. So I did some experimenting. To give the tea leaves more room to expand, I put fewer tea leaves inside the teaball. Depending on the type of tea, the brew often tasted weak. Larger teaballs are available, but they don’t always fit into a teapot. And they actually displace quite a bit of water when infused, so it's important to use a large enough pot that isn't filled to the brim with water. You can guess what kind of a mess this can make otherwise. Some of the stainless steel teaball models are made of 2 pieces that screw together into an oval. Besides being difficult to clean, they are also sometimes hard to screw and unscrew. We recommend avoiding a teaball with this design. After thoroughly exhausting the world of teaballs and still not feeling satisfied, I moved away from using these devices and went looking for a different tea infuser. A teapot is a necessity for some people. But when I started out, it was just another accessory—nice to have but not necessary. For more details about brewing tea this way, see The Teapot. Using a teapot has the advantage of allowing the tea leaves to move freely in the water, giving the leaves unfettered space for unfurling and releasing their flavors, and giving you a tastier brew. Some teapots have a built-in strainer, or a removable infuser—both are very handy features as they provide the benefit of keeping the tea leaves out of your cup. But if your teapot does not have either of these features, you're in good company. You’ll just need a separate strainer or an infuser. Strainers are useful tools—you probably already have a few in your kitchen. 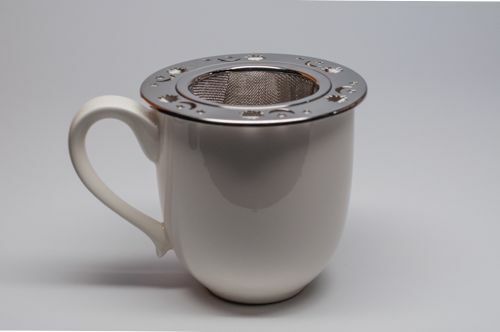 A tea strainer is small enough to fit over a cup and is usually, but not always, made of stainless steel. Strainers allow you to brew tea in a vessel of your own choosing, then strain out the leaves when pouring the tea into your cup. Some strainers can also be used as infusers, meaning they can sit inside the pot or cup while the tea brews. Most strainers have a fine enough mesh to capture the bulk of the tea leaves, but often some small particles will manage to get through and into your cup. Tea connoisseurs often strain the tea twice—once in the pot and an additional time with a very fine mesh strainer to keep every hint of leaf out of the cup. If you don’t like the residue at the bottom of your cup, use a very fine mesh strainer to keep it out. My sister says that if she were allowed to have only one infusing accessory, she would choose her tea infuser with a broad brim that fits onto a mug like the one shown here. She uses it just about every day for making a cup of hot tea. She's bought a couple cutesy versions of it over the years (shaped like little teapots or whatever), but they're too small to allow the leaves to expand and not deep enough to work well. So keep it practical. Look for a nice-sized tea infuser that gives the leaves plenty of room to expand, and a nice-sized rim that makes it easy to remove from your cup when the tea is finished. This is just the beginning of where you can start on your tea accessories journey—with tea infusers and strainers. There are many other accessories that can make your tea life easier. You can find a discussion of tea scoops, do-it-yourself teabags, and teabag squeezers at Tools for Making Tea, and more at Tea Accessories for Making Great Tea.